Australian-owned ANZ Bank has won the annual Roger Award for worst transnational company operating in New Zealand, due to its leading role in the nation’s financial sector strife. A panel of five judges said foreign-owned banks in general were a large drain on New Zealand’s economy. Allegations of distortions of lending margins, tax avoidance, risky lending practices, overcharging, and poor customer treatment were rife, the judges said. However the ANZ’s behaviour during 2009, particularly its part in the ING funds fiasco, made the bank the unanimous pick for the top title, they said. 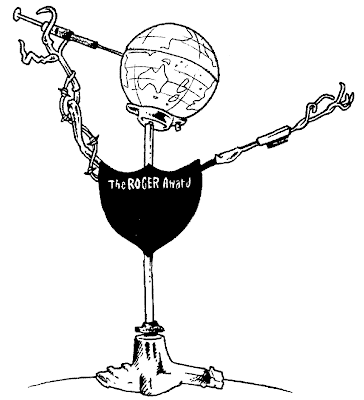 ANZ did not respond to requests for comment on its Roger Award win. Bloody banks eh? I love how NZers bailed them out with guarantees with our tax payer dollars when unregulated neo-liberal corporate greed sent the global economy down the drain, yet the banks are increasingly taking a harder line with forced sales of peoples family homes. Surely if we backed them, the Government should be taking a harder line on Banks desires to force the sale of people's family homes. ANZ got special attention this year because of their disgusting behaviour over the ING fiasco, good job they get reminded of that. On the topic of banks and neo-liberal greed, why were the rules of the free market as espoused by bankers not applied to their own institutions? Yeah I know, too big to fail. But I thought the market was supposed to regulate itself. Perhaps some more valuable lessons may have been learnt if Milton Friedman's dogma was allowed to reach it's proper conclusion?